Ok, so I'm a bit late in posting this (the game has been on sale now for over 24 hours and I've already shifted half my stock), but nonetheless I'm super-proud to announce that RGCD's first collaborative game project with Psytronik Software is finally available to buy. 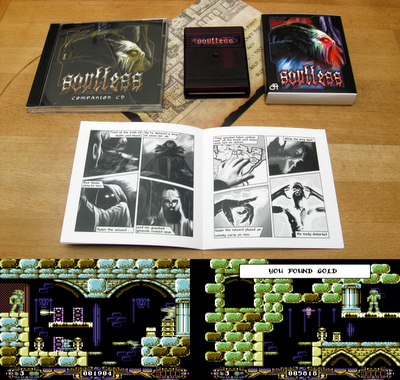 So, without further ado I hereby introduce you to the cartridge version of Soulless, a game by Georg Rottensteiner and Trevor Storey. 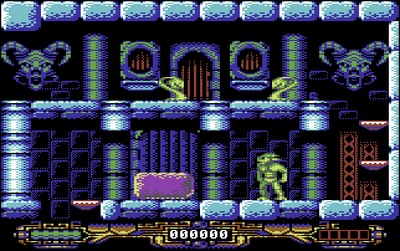 RGCD's biggest game release to date, it was a real struggle to squeeze this epic adventure complete with full intro and outro sequences into the 64KB limit, but nonetheless Georg succeeded in releasing a cartridge version to go alongside the tape, disk and download releases on sale via Psytronik's online store. A hybrid of Draconius and Impossible Mission, Soulless is an exploratory platformer that sees you playing the role of a betrayed King who has been transformed into a beast and trapped within an subterranean prison, your mission being to gather the soul-stones hidden throughout the 70+ screen underworld in order to regain your humanity. When collected, the soul-stones must be placed in the correct sequence within the chamber at the top of the map, but your quest will not be easy; not only is the underworld populated by foul traps and evil critters to avoid, but every time you play each of the stones will be hidden within a different object and their order randomised! Soulless is both NTSC and PAL compatible, and it's joystick-only control means that it's even playable on the Commodore 64 GS console. The game comes in an internally LED illuminated purple transparent cartridge shell complete with two printed soul-stone sheets, an A3 map and poster, stickers, a companion CD containing 600MB of bonus material and a 16 page comic/instruction booklet! These extras come at a cost though, and we at RGCD appreciate that the £28/30 inclusive price tag may be too expensive for some. 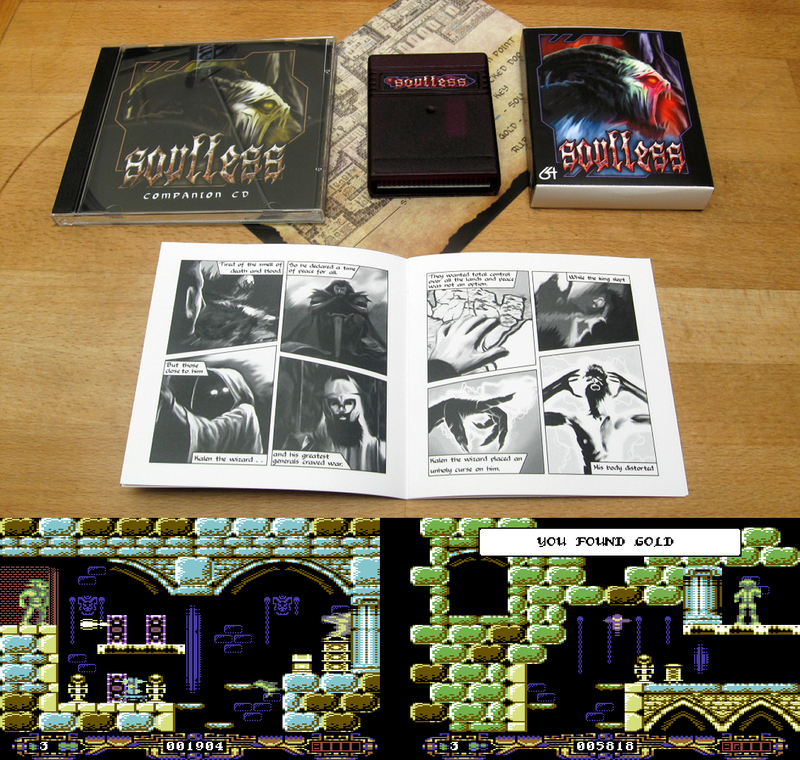 This is why we have also provided the option (in the destination box below) for customers to buy the boxed cartridge only at a reduced price (£25/26), with the instructions, map and soul-stone sheets provided by email (together with a digital copy of the game to play while you wait for the parcel to arrive). Grab your cartridge copy today from our online shop (£28 Europe/£30 Rest of World, shipping included) before they are all gone! Please note that Pystronik Software are also selling the game on disk, tape and as a digital download for £14.99/£4.99, £9.99 and £1.99 respectively (plus shipping). Perfect and Beautiful release. A release all 64 user need !!!!!!!! Psytronik's online store is not working, as also many other web sections. Please contact them and inform about this to avoid missing sales. Yeah kenz knows about the site being down, the problem is the at the other end (server crash) hopefully they'll have it sorted soon. Seemed to gather quite a bit of interest, especially after telling it was released (commercially) just a few days ago!